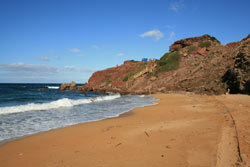 1, In one or two places you may have to lift the pushchair over rocks in the path and also over soft sand beaches. Starting in the car park on the Cap de Cavalleria road, double back on your self heading south along the road for 0.6 mile [1.0 Km]. At this point go through the sty beside the gate heading north. 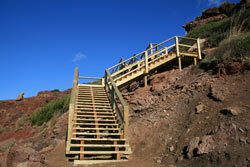 Follow the track through the menorcan countryside for 0.4 miles [0.7Km] until you reach the beach. 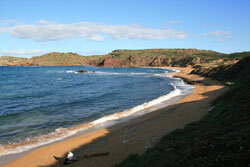 This northern Gold coast beach is one of Menorca's finest natural beaches. A long sweeping bay of fine golden sand backed by low sandstone and shale cliffs. The beach has no facility's at all so remember to take food and drink. At the eastern end of the beach are wooden steps up and off the beach giving good views over Menorca's rugged north coastline. The path then heads in a southerly direction, a short walk back to the car park. 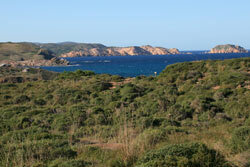 Menorca's north coast as nature intended. The decent to the beach.